Get ready for the first day of school with your preschool pals from Nickelodeon! 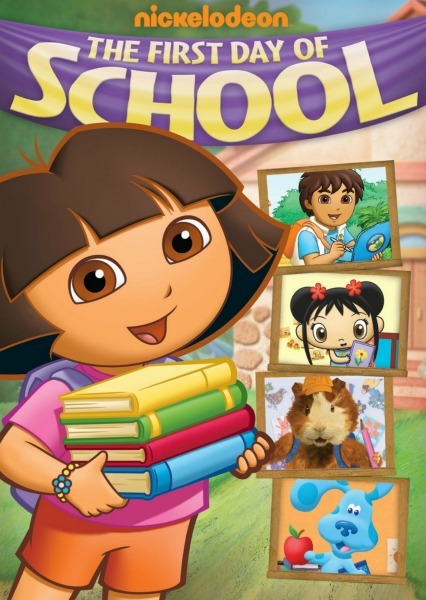 Dora the Explorer leads the way in this adventure-filled DVD, which also includes episodes from Go, Diego, Go! ; Blue’s Clues; The Wonder Pets! ; and Ni Hao, Kai-lan! Boots and Tico are really excited because it’s their first day of school and they’re going to learn in English and Spanish! Dora leads the way, teaching Boots Spanish and Tico English as they head out to school. At the river, their Guatemalan friend Camila shows them how to find turtles to ride across, then they go through the Forest where Swiper swipes Tico and Boots’ lunches and they have to find them. Alicia is opening a new library on the mountain top. Linda the Llama was supposed to bring the books for the library — but she’s late and it’s almost time to open the library. Diego finds Linda the Llama and they set off for the library. But first they’ve got to go up and down the rocky mountains by saying “arriba/abajo,” then a big wind blows away the library books and it’s up to the viewer to find them. It’s Periwinkle’s first day at preschool, and everyone needs to help Periwinkle make it through his first day. From finding his cubby and getting through circle time, to reading the job chart and understanding how to take turns and respect others, Periwinkle has a lot to learn. Off to School– The Wonder Pets help our old friend the Baby Blowfish overcome her separation anxiety on her first day of Fish Preschool. Save the Pangaroo — The Wonder Pets help a kid-art Pangaroo, a fictional animal that is part kangaroo and part parrot, who has been thrown away in the trash. Today, Kai-lan is having a playdate with her best girl friend, Lulu the rhino. Kai-lan has all sorts of games to play with Lulu, but Lulu wants to play with different things than Kai-lan. Kai-lan and Lulu need the viewers’ help to figure out a way to compromise and play things that make them both happy. Purchase Nickelodeon Favorites: First Day of School on DVD today from Amazon.com. One lucky reader will receive a Nickelodeon Favorites: First Day of School DVD! Giveaway ends September 11th at 11:59pm, open to US residents, ages 18+. To enter please use the Rafflecopter form below. Good luck.